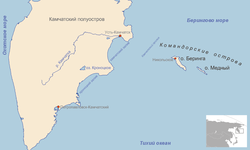 The Commander Islands or Komandorski Islands or Komandorskie Islands (Russian: Командо́рские острова́, Komandorskiye ostrova) are a group of treeless, sparsely-populated islands in the Bering Sea located about 175 kilometres (109 mi) east of the Kamchatka Peninsula in the Russian Far East. The islands consist of Bering Island (95 kilometres (59 mi) by 15 kilometres (9.3 mi)), Medny Island (55 kilometres (34 mi) by 5 kilometres (3.1 mi)) and fifteen smaller ones (islets and rocks), the largest of which are Tufted Puffin Rock (Kamen Toporkov or Ostrov Toporkov), 15 hectares (37 acres), and Kamen Ariy, which are between 3 kilometres (1.9 mi) and 13 kilometres (8.1 mi) west of the only settlement, Nikolskoye. Administratively, they compose Aleutsky District of Kamchatka Krai in Russia. Map showing the position of the Commander Islands to the east of Kamchatka. The larger island to the west is Bering Island; the smaller island is Medny. The Commander Islands are the westernmost extension of the Aleutian Islands, most of which are part of the US state of Alaska, though they are separated from the closest US island, Attu Island, and the rest of the chain by 207 miles (333 km). Between the two runs the International Date Line. The relief is somewhat diverse, encompassing folded-block mountains, volcanic plateaus, terraced plains and low mountains. The geologic origins are long-extinct volcanoes on the edge of the Pacific and North American Plates. The highest point is Steller Peak on Bering Island at 755 metres (2,477 ft). The highest point on Medny Island is Stenjeger's Peak at 647 metres (2,123 ft). The climate is relatively mild and maritime, with frequent precipitation (220–240 days/year). The cool summers are notoriously foggy. The only permanently inhabited locality is the village of Nikolskoye on the northwest end of Bering Island, with an estimated population of 613 as of 2009[update]. This consists almost entirely of Russians and Aleuts. The majority of the islands' area, as well as much of the adjacent marine habitat (14,088 square miles (36,488 km2)), is taken up by the Komandorsky Zapovednik, a natural preserve. The economy is based primarily on fishing, mushroom gathering, the administration of the zapovednik, ecotourism and government services. The village has a school, a satellite tracking station and a dirt airstrip south of the village. Detail from an early map by Bering expedition member S. Khitrov of eastern Kamchatka, including the Commander Islands, with drawings of Steller's sea cow, the northern fur seal and the Steller sea lion. Due to the high productivity of the Bering Sea shelf and the Pacific slope and their remoteness from human influence, the Commander Islands are marked by a great abundance of marine animal life and a relative paucity of terrestrial organisms. Notably, significant numbers of northern fur seals (some 200,000 individuals) and Steller sea lions (approximately 5,000 individuals) summer there, both on reproductive rookeries and non-reproductive haul-outs. Sea otters, common seals and larga seals are likewise abundant. Indeed, the sea otter population is stable and possibly increasing, even as their population is falling precipitously in the rest of the Aleutian islands. The neighboring waters provide important feeding, wintering and migrating habitat for many whale species, many of which are threatened or endangered. Among these are: sperm whales, orcas, several species of beaked whales and porpoises, humpbacks and endangered species such as the North Pacific right whales and fin whales. The much less diverse terrestrial fauna includes two distinct, endemic subspecies of Arctic fox, (Alopex lagopus semenovi and A. l. beringensis). Though relatively healthy now, these populations had been significantly depleted in the past due to the fur trade. Most other terrestrial species, including wild reindeer, American mink and rats have all been introduced to the islands by man. Over a million seabirds gather to nest on numerous large colonies along almost all the coastal cliffs. The most common are northern fulmar; common, brunnich's and pigeon guillemots; horned and tufted puffins; cormorants; gulls; and kittiwakes including the extremely local red-legged kittiwake which nests in only a few other colonies in the world. Waterfowl and sandpipers are also abundant along the pre-lake depressions and river valleys of Bering Island, though largely absent from Medny Island. Migratory birds of note with critical nesting or feeding habitat on the islands include such species as Steller's eider, Pacific golden plover and Aleutian tern. Raptors of note include the rare Steller's sea eagle and gyrfalcon. In total, over 180 bird species have been registered on the Commander Islands. The fish fauna in the mountainous, fast running streams is composed primarily of migratory salmonids, including Arctic char, Dolly Varden, black spotted trout, chinook, sockeye, coho and pink salmon. Bering Island was the only known habitat of Steller's sea cows, an immense (over 4000 kg) sirenian similar to the manatee. The sea cow was hunted to extinction within 27 years of its discovery in 1741. The spectacled cormorant, a large essentially flightless bird in the cormorant family, was similarly driven to extinction by around 1850. There is no true forest on the Commander Islands. The vegetation is dominated by lichens, mosses and different associations of marshy plants with low grass and dwarf trees. Very tall umbellifers are also common. There are no amphibians or reptiles on the Commander Islands. The Commander Islands received their name from Commander Vitus Bering, whose ship St. Peter wrecked on the otherwise uninhabited Bering Island on his return voyage from Alaska in 1741. Bering died on the island along with much of the crew. His grave is marked by a modest monument. About half of the crew did manage to survive the winter, thanks in part to the abundance of wildlife (notably the newly discovered Steller's sea cow) and the efforts of naturalist and physician Georg Wilhelm Steller, who cured many of the men of scurvy by compelling them to eat seaweed. Eventually, a smaller boat was built from the remains of the St. Peter and the survivors found their way back to Kamchatka, heavily laden with valuable sea otter pelts. The discovery of the sea otters sparked the great rush of fur-seeking "Promyshlenniky" which drove the Russian expansion into Alaska. Steller's sea cow, whose habitat was apparently restricted to the kelp-beds around Bering Island, was exterminated by 1768. 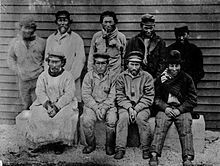 Aleut (Unangan) people were transferred to the Commander Islands early in 1825 by the Russian-American Company from the Aleutians for the seal trade. Most of the Aleuts inhabiting Bering Island came from Atka Island and those who lived on Medny Island came from Attu Island, now both American possessions. A mixed language called Mednyj Aleut, with Aleut roots but Russian verb inflection, developed among the inhabitants. Today the population of the islands is about ⅔ Russian and ⅓ Aleut. The 1943 Battle of the Komandorski Islands took place in the open sea about 160 kilometers (99 mi) south of the islands. Preobrazhenskoye, Kamchatka Oblast, a now-abandoned village on Medny Island. ^ Derbeneva, OA; Sukernik, RI; Volodko, NV; Hosseini, SH; Lott, MT; Wallace, DC (2002). "Analysis of Mitochondrial DNA Diversity in the Aleuts of the Commander Islands and Its Implications for the Genetic History of Beringia". American Journal of Human Genetics. 71 (2): 415–21. doi:10.1086/341720. PMC 379174. PMID 12082644. ^ a b c d Barabash-Nikiforov, I. (November 1938). "Mammals of the Commander Islands and the Surrounding Sea". Journal of Mammalogy. 19 (4): 423–429. doi:10.2307/1374226. JSTOR 1374226. ^ Doroff, A.; J.A. Estes; M.T. Tinker; et al. (February 2003). "Sea otter population declines in the Aleutian archipelago". Journal of Mammalogy. 84 (1): 55–64. doi:10.1644/1545-1542(2003)084<0055:SOPDIT>2.0.CO;2. ISSN 1545-1542. ^ "Командорский - Японский гладкий кит Eubalaena japonica Lacepede, 1818". komandorsky.ru. Retrieved 18 September 2018. ^ "Командорский - Финвал (сельдяной кит) Balaenoptera physalus (Linnaeus, 1758)". komandorsky.ru. Retrieved 18 September 2018. ^ Johansen, H. (January 1961). "Revised List of the Birds of the Commander Islands". The Auk. 78 (1): 44–56. JSTOR 4082233. ^ Anderson, P. (1995). "Competition, predation, and the evolution and extinction of Steller's sea cow, Hydrodamalis gigas". Marine Mammal Science. 11 (3): 391–394. doi:10.1111/j.1748-7692.1995.tb00294.x. ^ BirdLife International (2004). "Phalacrocorax perspicillatus". IUCN Red List of Threatened Species. Version 2006. International Union for Conservation of Nature. Retrieved 10 May 2006. ^ Steller, G.W. (1988). O.W. Frost (ed.). Journal of a Voyage with Bering, 1741–1742. M. A. Engel; O. W. Frost (trans.). Stanford: Stanford University Press. ISBN 0-8047-2181-5.